One thing I like about Indeni and the new R80 (haven’t seen it, just the gossip) is the MDS will be merged with SmartCenter so that one can see all your firewalls (not a domain at a time). This takes us closer to the single-pane of glass security management solution that CheckPoint excels at. I’d like to see ALL my firewalls in one window not just a domain at a time. Indeni is similar in that it let’s you monitor all your firewalls from an enterprise view which I like (haven’t seen it in a while, but use to anyways).With SmartMonitor you only get a domain at a time and then you only get 1 firewall at a time, not even a cluster so its somewhat limited. (And remember if you have SecureXL on, the traffic stats are horked). Anyways I diverge. So until R80 comes out with the REST API, I am working on building my own enterprise MDS that is web based. It will allow you to start Putty sessions on ALL your MDS firewalls and SmartDashboard on ALL your MDS firewalls so you don’t have to go into each domain. which I then import into a SQL database and go from there. So I thought I’d share with you this tool because you can use it to dump into your asset tracking or script databases to access all your firewalls. This script is cool because it gives you the hardware type and version numbers for all your firewalls. This took a bit of ‘awk’ munging to do because clusters are weird and R77.10 does clusters differently. So we have these older log servers (common in most places I’ve worked) that need to be upgraded but of course its more fun trying to squeeze more blood from a turnip then playing politics of buying a $8K log server. and I’ve never figured out why. So our super duper diamond guy Taylor had an idea from R&D to offload the FWD logging process from all its LEA work (sending logs to SEIM, Smartevent, Tufin), and let it just handle gateway logs. So normally FWD is sucking hard at the CPU and you see numbers like 190% CPU time (sorry don’t have any snapshots of it) for FWD. So check out what happened when we spawned off the LEA handing. 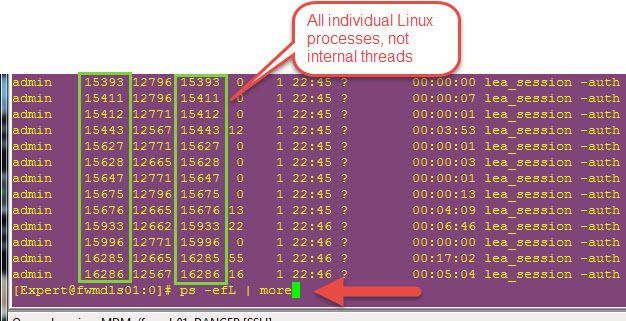 So normally you see a parent FWD with internal threads (not processes). The green boxes are the internal thread IDs and the red boxes are the parent process id. So the example below has 3 internal threads 15259, 15260,15261. When we issued the magic command, the lea processes became their own FULL processes and NOT internal threads. Their process id and thread id are the same, this is how you tell. So now check out the CPUs, instead of a couple individual CPUs at 100% and the rest at 0%, now you have them all at 20%-60% (and this is low). This is because the LEA processes are fighting for processors when before they were buried inside an single individual FWD with the whole FWD fighting for a processor and the FWD process had the processor at 100% doing 10 different tasks. You can see smartlog and LEA sucking hard, while FWD instead of being at 110% is now at 14%. Unfortunately this did not solve the problem of dropped logs and slowed down SmartLog and SmartTracker. So we may back out. 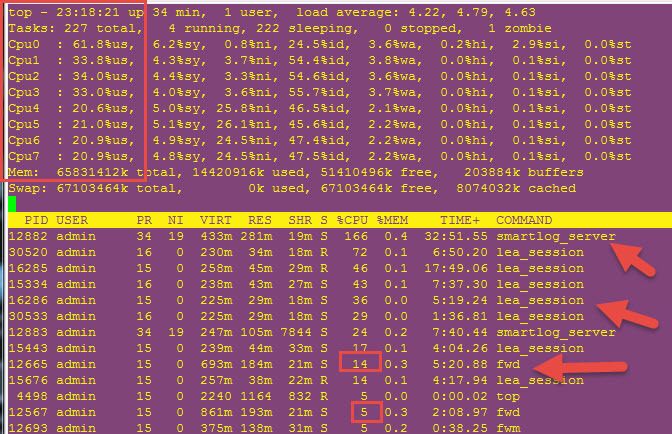 But it was cool to see that logging is not sucking the CPU, its LEA and SmartLog indexing that keeps a log server busy. Morale of story: Spend more money on log servers than MDS’s. Only split out LEA if you have a ton of CPUs. Who needs SecureXL when you can turn off AntiBot? This is a weird one that I tracked down, but can’t take credit for fixing. Our AntiBot and AntiVirus sites were whining about things being slow after we installed firewalls with AB and AV. Well, you know how users whine all the time – who listens to them anyways? So they can’t get to Oprah’s home page, big deal. Well one site was slow but this one single DNS name would NOT resolve. The request hit the client side of the firewall and never came out the DNS server side….for only this ONE DNS name. In addition, they are in DETECT only mode…so what could go wrong? Turns out AB/AV does reviews of DNS names before releasing the connection. 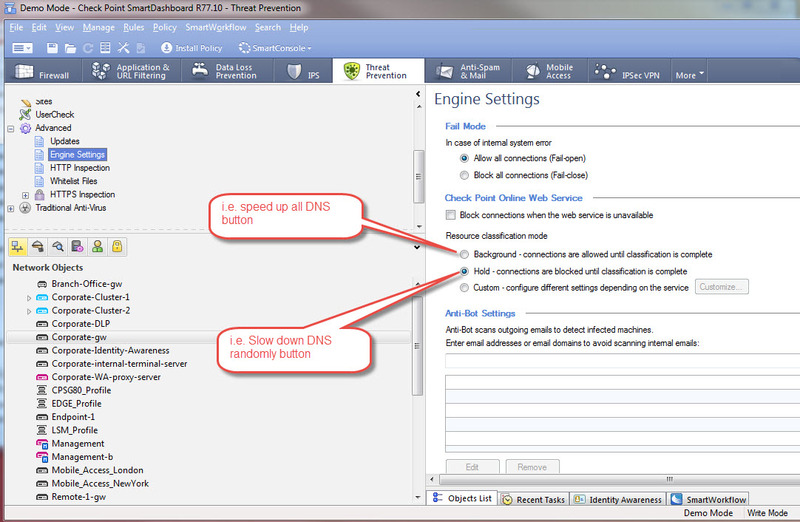 You’ll see the client side nslookups have 2 second timeouts most the time. Have to do ‘background’ reviews and not ‘hold’ the connection. Geez louise. Geez I hate those random problems.